Locally known as “Lauki” (Hindi) or “Sorakkai” (Tamil), this veggie is not that popular in the western world.Found in every kitchen of the Indian household, bottle gourd believed to have originated in Africa, constitutes a major part of food in the Indian cuisine. Like it or not, this gourd has dominated the domestic main course menu for time immemorial. Hi friends! 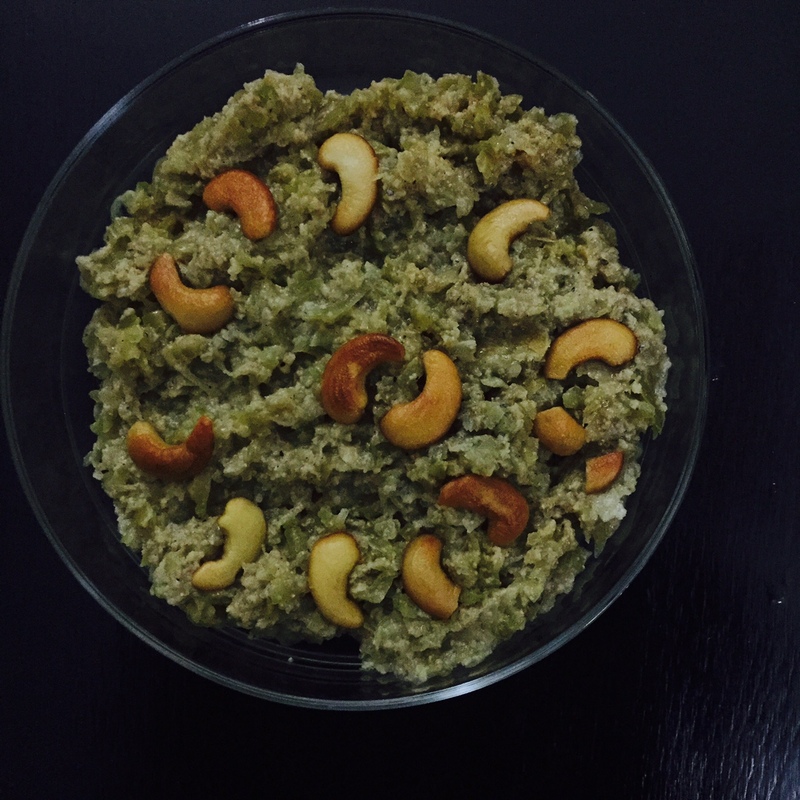 Try this easy recipe to make lauki halwa , it is simply delicious! Wash and peel the Lauki/Bottle gourd/Ghiya and grate it in a mixing bowl. Keep aside. Heat milk in a wok/Kadahi/non-stick pan and bring it to boil. Add the grated Lauki and cook till it gets cooked and the mixture starts thickening. When 80% of the milk evaporates, add sugar and poppy seeds and cook on low flame while stirring continuously, till the sugar dissolves. Add cream and green cardamom powder to the cooked Lauki and mix it well. Cook on low flame for another ten minutes or till very well blended. Switch off the stove. Remove it in a dessert serving bowl and serve hot, warm or cold, garnished with slightly fried or roasted cashew nuts. What’s making this veggie popular these days is its enormous impact on the treatment of high blood pressure and heart disease. The myriad of health benefits of bottle gourd is least known to many.Bottle gourd is believed to help the liver function in a balanced fashion. The juice from the leaves help cure jaundice and the juice from the gourd helps reduce graying of hair. The gourd juice, helps treat burning sensation in the urinary passage if consumed with lime juice. It reduces fatigue and keeps you fresh, especially during summer. It helps fight constipation, as it is fiber rich. Because of its fiber and low fat content, Ayurveda highly recommends this food for diabetic patients and young children. Ayurveda also recommends the juice of this gourd in the treatment of acidity, indigestion and ulcers as it serves as an alkaline mixture. Indian traditional medicine claims that bottle gourd acts as a nerve tonic and can help improve obsessive-compulsive disorder (OCD). This claim has been confirmed by a study published in the journal Pharmacognosy Research where the investigators found that the plant possesses anti-compulsive (anti-OCD) activity although they are not certain about the mechanism of action of this plant. Bottle gourd is also considered one of the best weight loss foods since it is 96 percent water and provides just 12 calories per 100g of serving. It is rich in, thiamin, vitamin C, zinc, iron and magnesium thus helping in improving overall health. The juice from bottle gourd leaf helps in curing baldness and aids in preventing tooth decay. So the good old “lauki”, though neglected the most, has both healing and cosmetic benefits that many people are unaware of. These easy growing climbers have made a great impact on the domestic gardening segment as well, due to its enormous health benefits.